The name lute generally refers to a plucked string musical instrument with a neck (either fretted or unfretted) and a deep round back. More specifically it applies to an instrument from the family of European lutes. The European lute and the modern Near-Eastern oud both descend from a common ancestor via diverging evolutionary paths. The player of a lute is called a lutenist, and a maker of lutes (or any string instrument) is referred to as a luthier. Plucked instruments existed in a variety of forms in ancient Egyptian (in the Middle Kingdom), Hittite, Greek, Roman, Bulgar, Turkic, Indian, Chinese, and Armenian/Cilician cultures. As early as the 6th century, the Bulgars brought the short-necked variety of the instrument called the Kobuz to the Balkans.In the next century an instrument called the Barbat appeared in Persia, Armenia, and Byzantium which was similar to the lute but had an animal skin as a soundboard. The lute's distinctive shape and name are both derived from the Arabic instrument the 'ud, from al'ud meaning "the wood", this perhaps referring to the wooden soundboard. The instrument originally arrived in Europe during the Middle Ages, perhaps brought back from the Crusades, or via Moorish Spain. 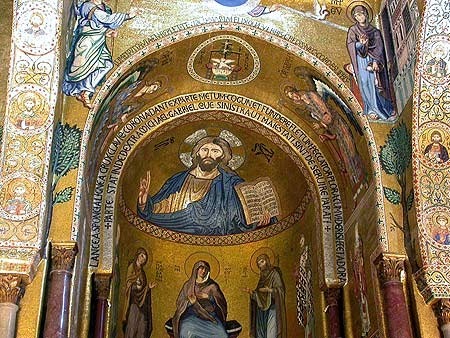 Another point of transfer may have been Sicily where there were singer-lutenists at the court of Palermo following the Norman conquest of the island. The lute is depicted extensively in the Cappella Palatina's ceiling paintings, dedicated by the Norman King Roger II in 1140. 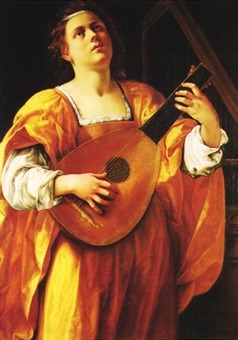 In this era the lute remained similar to it's predecessor having five courses (pairs) of strings, and continued to be played with a quill plectrum. This limited the players to single-line parts and so was often featured in ensembles rather than as a solo instrument. 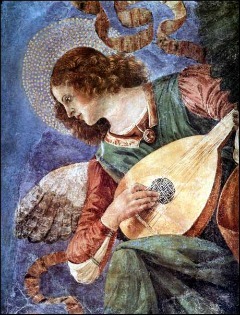 By the 14th century the lute was found throughout Italy and even north into Germanic Central-Europe. Following the trend towards polyphony during the Renaissance, late in 1400's lutenists began plucking multiple strings with fingers instead of the quill. This technique enabled the lute to become the premier solo instrument of the era, though it continued to be used to accompany singers as well. The number of courses increased to ten during the Renaissance, and lutenists in the baroque era continued to add courses with as many as nineteen being used. 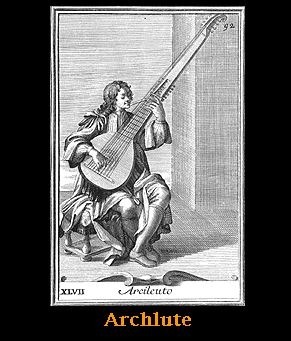 The construction of the lute evolved to accomodate these extra courses and they became so far removed from the original instrument that they were given new names : The archlute, theorbo and torban had long extensions to the neck for the extra length of the bass strings, these were all played "open" outside the the fretboard as the left-hand fingers were not long enough to fret the bass strings. Over the course of the Baroque era the lute was increasingly relegated to continuo accompaniment, and was eventually superseded in that role by keyboard instruments. Competition with the guitar saw the lute almost dissappear after 1800. A revival was enjoyed by the lute around 1900 with the awakening of interest in historical music. Later in the 20th century the Early Music Movement further boosted this revival, and artists such as Julian Bream, Hans Neemann, Walter Gerwig, Suzanne Bloch and Diana Poulton championed the instrument. the Italian Francesco da Milano (1497-1543) who shared with Michelangelo the nickname 'il Divino', the divinely-inspired. His music aspired to grace, elegance, and playfulness. John Dowland (1563 – 1626) of Elizabethan England whose songs and fantasies are widely played by guitarists today. The French Baroque lutenists such as Robert de Visee and Denis Gaultier (1575 - 1651) who created stately music for their aristocratic patrons. Johann Sebastian Bach (1685 - 1750) wrote for the lute and was friendly with the greatest lute composer of the Late-Baroque period, Sylvius Leopold Weiss (1687 - 1750).